Next week (on Dec. 5-6) a conference titled Religion, Art & Conflict: Disputes, Destruction and Creation will take place at the wonderful Courtauld Institute of Art in London. During this conference, I will be speaking about one of my research interests: the arts policy of the Vatican. 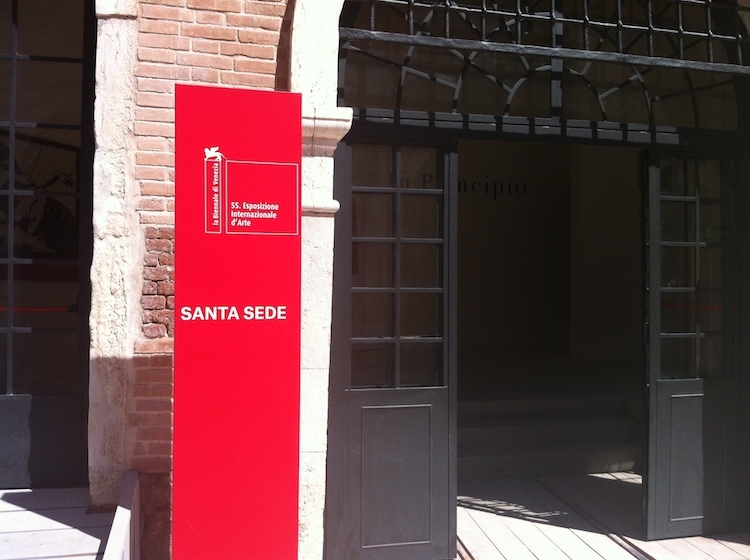 My paper presentation deals with the first pavilion of the Vatican at the Venice Biennale of 2013. See below for the abstract of my paper. And, obviously: if you happen to be around – make sure to drop by for two days of wonderfully engaging talks covering a broad spectrum of times and places in the history of art and its relation to religion. For the full program, all the paper abstracts, and info on booking: see the conference website! Theological and religious conflicts can be an impetus for new approaches to the arts. An interesting case in point is the Vatican pavilion at the 2013 Venice Biennale. It sheds light on the way the Vatican attempts to position itself in an ever transforming and not necessarily welcoming world. The Vatican phrases this as an attempt to fix a broken marriage between art and faith. Both the Vatican and the contemporary art world demonstrate a search for whether and how to fix this broken marriage. The art world shows a renewed attention for transcendence and aesthetics and the Vatican attempts to seize momentum to explore new visual languages to formulate contemporary takes on theology. Looking at the Biennale pavilion results in at least three lines of inquiry: 1) how the Vatican builds on the tradition of the church as a successful commissioner and finds transformed ways of positioning itself; 2) how the Vatican reaches out to contemporary artists, despite -or because of- the reciprocal friction; and 3) how the artistic turn to aesthetics of the last decades, reiterating art’s experiential character, gives the Vatican a visual language to work with. Despite this latter point, the presentation to contemporary audiences and artists remains a challenge. By employing the notion of creation in the pavilion, the Vatican found a way to address both artistic and religious languages in their Biennale pavilion. Ultimately, this paper explores how the notion of religion is approached and framed through the artists and art works selected for the Biennale pavilion, which is in turn related to Vatican’s aim of repositioning itself in the contemporary art world. Ohhhh…lekker naar Lundun….goed hoor! Veel succes! En plezier… Was het een succes gisteravond…ongetwijfeld…alhoewel..zonder mijn geweldige inbreng….